Sandia National Laboratories researcher Geoff Klise worked with Solar Power Electric to develop a tool that can be used to appraise photovoltaic installations on homes and businesses. Scientists at Sandia National Laboratories and Solar Power Electric teamed together to develop a tool to appraise homes and commercial buildings with photovoltaic (PV) installations. Dubbed PV Value, this electronic form will serve as a standard methodology for appraisers, real estate agents and mortgage underwriters that need to accurately value PV systems. ALBUQUERQUE, New Mexico – Consistent appraisals of homes and businesses outfitted with photovoltaic (PV) installations are a real challenge for the nation’s real estate industry, but a new tool developed by Sandia National Laboratories and Solar Power Electric and licensed by Sandia addresses that issue. Sandia scientists, in partnership with Jamie Johnson of Solar Power Electric, have developed PV Value, an electronic form to standardize appraisals. Funded by the Department of Energy’s Office of Energy Efficiency and Renewable Energy, the tool will provide appraisers, real estate agents and mortgage underwriters with more accurate values for PV systems. The tool uses an Excel spreadsheet, tied to real-time lending information and market fluctuations, to determine the worth of a PV system. An appraiser enters such variables as the ZIP code where the system is located, the system size in watts, the derate factor – which takes into account shading and other factors that affect a system’s output – tracking, tilt and azimuth, along with a few other factors, and the spreadsheet returns the value of the system as a function of a pre-determined risk spread. The solar resource calculation in the spreadsheet is based on the PVWatts simulator developed by the National Renewable Energy Laboratory, which allows the spreadsheet to value a PV system anywhere in the U.S. The tool is being embraced by the Appraisal Institute, which is the nation’s largest professional association of real estate appraisers. “From my perspective as an appraiser, I see that this is a great tool to assist the appraiser in valuations, and it connects to the Appraisal Institute’s recent Residential Green and Energy Efficient Addendum. It’s an easy, user-friendly spreadsheet that will not bog the appraiser down with a lot of extra time in calculations, and if they fill out the addenda properly, they’ll be able to make the inputs and come up with some numbers fairly quickly,” said Sandy Adomatis, SRA, a real estate appraiser and member of the Appraisal Institute. Although the tool is licensed for solar PV installations, it could be used for other large green features in a home that generate income, such as wind turbines. The spreadsheet, user manual and webinar explaining the tool are available for download at http://pv.sandia.gov/pvvalue. Solar Power Electric located in Port Charlotte, Fla., is an electrical contracting and solar integration company specializing in the installation of commercial and residential photovoltaic systems. 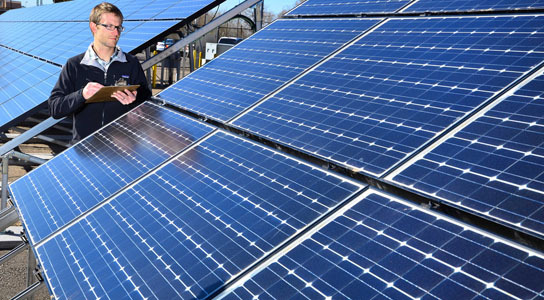 Be the first to comment on "Scientists Develop “PV Value” to Accurately Appraise PV Systems"